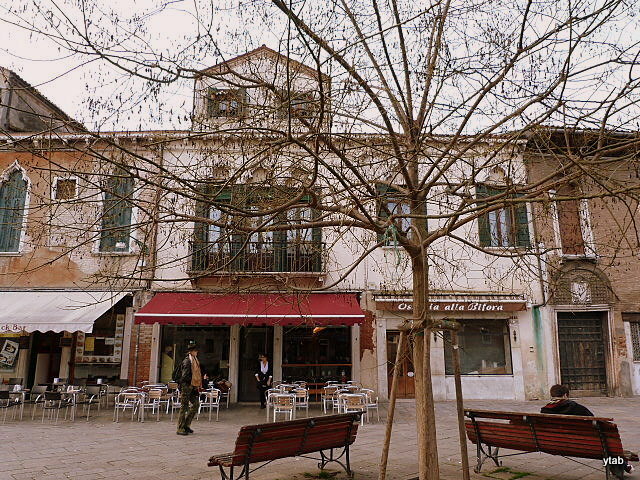 How many times have we passed these buildings, or eaten and had something to drink at one of the cafes? Little did we know that they are probably from the 14th-15th century, although they have been somewhat rebuilt. Apparently, this doorway is from the 13th (or possibly even the 12th) century! Do stop and admire it next time you pass that way. Now, doesn’t this look very familiar? I wish we could meet there right now, for a great cup of coffee, or a spritz. 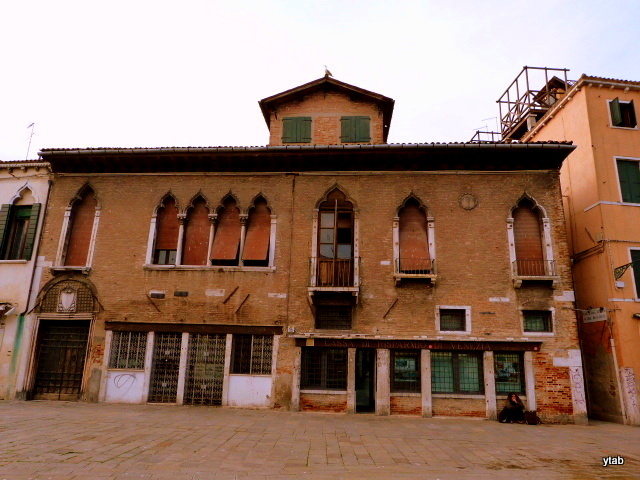 Reblogged this on Venice Domestic Architecture. 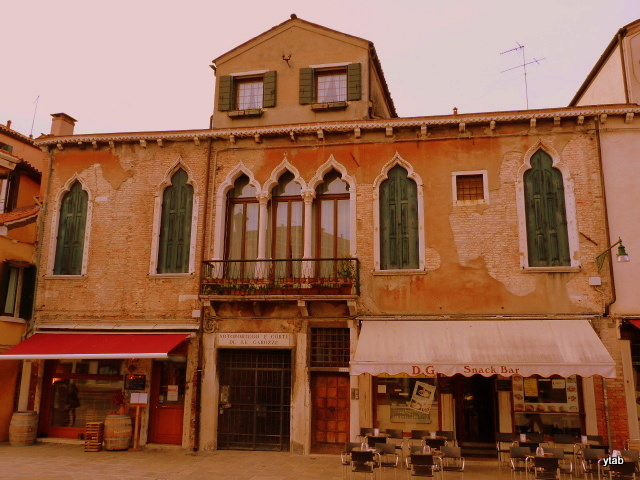 I never get tired of looking at the architecture in Venice (and other Italian cities). Dan and I are your Team Campari. And we will make sure there is no olive in your spritz, as i recall that’s how you like it. It’s funny, I see spritz drinks (sorta) here on the menus in Seattle, and I just can’t order one. 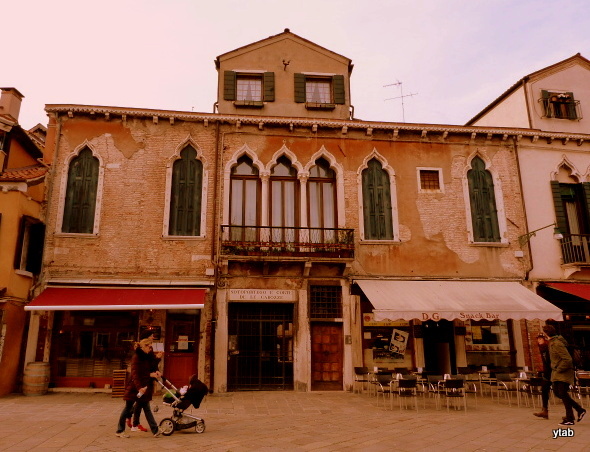 I just have to be in Venezia…which hopefully will be sooner than later! Plus it’s the only time I have chips! Cheers, sante, chin chin everyone! Yay, I think the Campari team is in the lead. What will be the prize. Maybe another round of drinks, it’s my shout! You can add Marco to the Campari team, and yes, with an olive! And, if Caroline and Phil are free, that’s 2 more for Camapari. You can have my olive, I’ll eat your chips. 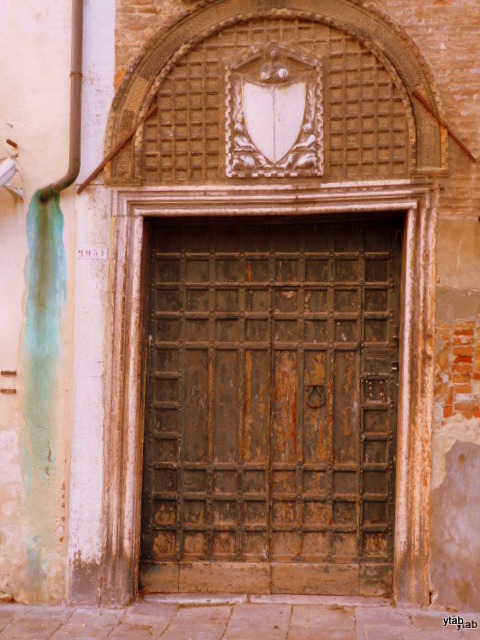 Fine thanks, just dreaming of Venice…. When do you next plan to return? I noticed that the next Su e Zo per i Ponti (the big walk around Venice) is on 19 April next year, so I hope to take part in that. Have you any plans for the next visit? Aperol for me – with an olive of course…… but I’ll graciously accept a slice of orange instead if need be. And, that first spritz you drink when you get to Venice, heaven! How are you folks? Two spritz with Aperol please, for us. A spritz doesn’t taste quite the same over here, somehow, even though we’ve got Sainsbury’s stocking Aperol now! OK, Susie and Andrew, I’ve got that. Linda and Darlene, how would you like your spritz, with Aperol or Campari? Do you all like olives? One cappuccino coming up, Michelle. It should be lovely in the campo this afternoon. Aperol per me, per favore. Me too Y! Un spritz con Campari! This is what I love about our lovely lady…her many layers of history!!! Wouldn’t it be wonderful to meet for a spritz! !